For Sale: 1973 Triumph 750cc, Bonneville, 5 Speed. Engine completely rebuilt: crank grind, new big end/main bearings, rebore, new .040 pistons, rings, valve guides, rebuilt gearbox, new clutch. 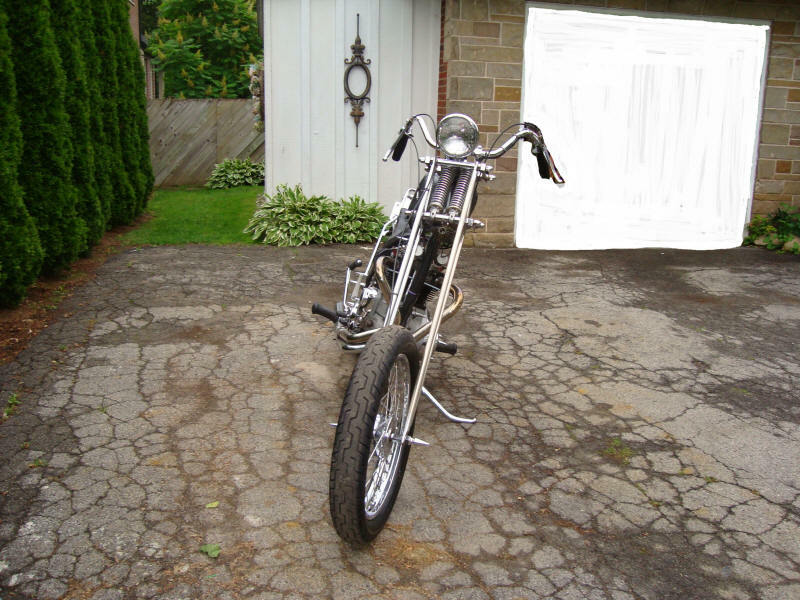 The Rebuild was done by a licensed British motorcycle mechanic in Hamilton Ont. I originally built the bike in 1976 but can't ride the ridgid frame anymore. This bike has a new front tire/new tube, very good rear tire/new tube, new rear chain, new battery, new speedometer cable, new K&N air filters, new Lucas points/condensers. It has a stock, unraked, 1965 Triumph front frame section with a bolt on hardtail fully welded and I molded the entire frame to smoothover all of the connections and mounts. The rear wheel is a Triumph hub with a 16inch Harley rim. Front fork is a Jammer ,10 inch (over stock), dual spring, girder with a 5 inch mini drum wheel (I bought the front end new in 1975). It has a Corbin Gentry Dragoon seat and pee pad. The gas tank is a 2-1/2 gal. Harley Sporster tank, along with the handlebars which are Harley Sportster. The exhaust system is Alphabet Headers into a stainless steel Harley tail pipe. The bike still has the original custom paint job done by Dennis.